A Stinging Commentary on Wasps, Yellowjackets, and Baldfaced Hornets. Paper Wasps, Yellowjackets, and Baldfaced Hornets are beneficial insects. Just keep repeating that to yourself when you're being chased or stung by these hymenopteran marauders! They’ve been with us since the beginning of the season. However, this is the time of the year when their ever-expanding nests become large enough and contain enough individuals to make their presence sometimes painfully known. Paper Wasps (Polistes spp. ), Yellowjackets (Vespula spp. and Dolichovespula spp. ), and Baldfaced Hornets (D. maculata) all belong to the same family, Vespidae. Note that despite their common name, the genus for baldfaced hornets, Dolichovespula, tells us that they are in fact a type of yellowjacket. Indeed, taxonomically speaking, North America never had a “true hornet” until the European Hornet (Vespa crabro) was introduced some years ago, but that’s another story. All of these insects use their powerful mandibles to grind-up fibers gathered from dead wood and plant stems which they mix with their saliva to extrude water resistant paper used to construct their nests. The nests were first initiated in early spring by individual queens that spent the winter in a protected location. A single queen was responsible for starting each of the paper nests visible at this time of the year. 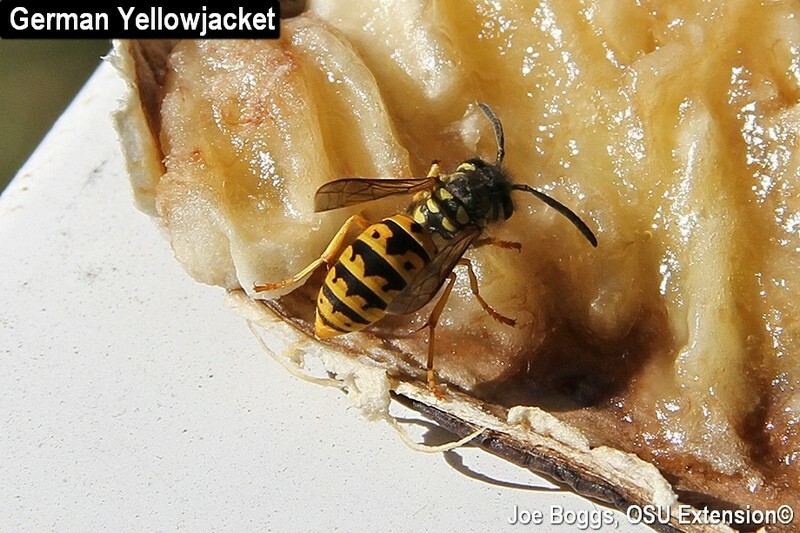 All species of yellowjackets in Ohio build circular to oblong “closed” paper nests. An outer paper envelope encloses multi-tiered paper “combs” that house the immature yellowjackets (larvae). The non-native German (European) (Vespula germanica) and Common (V. vulgaris) Yellowjackets build nests underground or occasionally in hollow trees, rock crevices, or crevices in buildings. The native Eastern Yellowjackets (V. maculifrons) build their nests underground and Aerial Yellowjackets (Dolichovespula arenaria) as well as baldfaced hornets build exposed nests in trees, shrubs, or on buildings. Southern Yellowjackets (V. squamosal) build both underground and aerial exposed nests. Paper wasps construct exposed paper nests with the larval chambers clearly visible. Our native paper wasps tend to position their nests in a protected location such as under the eaves of buildings or occasionally inside buildings such as in attics. European Paper Wasps (P. dominula) present a dangerous exception. They may be found nesting in shrubbery where they’re painfully discovered during pruning or hedge trimming. Yellowjackets and paper wasps are important beneficial insects owing to their need to provide protein to their legless, helpless larvae in their nests. I once watched yellowjackets totally decimate a colony of redheaded pine sawflies (Neodiprion lecontei) with the sawfly larvae being carried off one at a time to become meat items for yellowjacket larvae. From late-spring through the summer, the ever-expanding numbers of yellowjacket and paper wasp workers keep busy enlarging their nests and foraging for caterpillars, sawfly larvae, and other soft-bodied insects. They use their powerful mandibles to grind-up these protein-rich meat items to feed to their larvae so they will development into new adults. Paper wasps also provide the added benefit of being important plant pollinators. They will visit flowers to feed on energy-rich nectar to support their predatory foraging and wood fiber gathering flights. I’ve discovered that “pollinator gardens” (a.k.a. butterfly gardens) are one of the best locations to photograph paper wasps. Unfortunately, yellowjackets have a deserving reputation for becoming a serious nuisance late in the season. Sometime in late-summer to early fall, drones (males) and new queens begin to develop in the nests. These new-comers do not require protein since they are not growing; they need energy from carbohydrates. So, they lounge around the nest begging the workers for sweets. In an effort to appease these freeloaders, the workers search for foods that have this much needed energy boost such as soda, donuts, and funnel cakes; the All-American fine cuisine I love to eat at county fairs! Thankfully for the over-worked workers, nest populations of adults begin to peak in the fall with 5,000 or more workers in the colony. As fall comes to an end, the new queens and drones leave their nest to mate, and the queens seek protected overwintering sites. The colony from which they developed dies during the winter; yellowjacket and paper wasp nests only last one season. This means that you should avoid declaring war on these stingers unless their nests are located where they presents a serious stinging hazard. The nests will eventually die-out on their own; with no fanfare for the poor overworked workers. Of course, yellowjacket and paper wasp workers will happily demonstrate their stinging capabilities any time during the growing season. However, understanding why they sting is important to avoiding painful confrontations. These insects will sting for two reasons: to defend their nests (and young) and to deliver venom to quickly subdue their prey. Fortunately, despite their belligerent reputations, paper wasps and yellowjackets, which of course includes baldfaced hornets, are seldom aggressive. What benefit would it be for them to waste energy chasing after people? Unless those people present a clear and present danger to their nests. The vast majority of painful encounters are associated with poorly planned and executed efforts to wage war on these beneficial insects. Indeed, even armed with serious insecticides, we are often woefully outclassed because they have been defending their nests for tens of thousands of years! So, just how painful are the stings? Not as much as you might think. In the mid-1980’s, Justin O. Schmidt (Southwest Biological Institute) developed the “Schmidt Sting Pain Index.” Using his own fingers, arms, etc., he allowed himself to be stung by a wide range of stingers so he could rank the pain on a 1 – 4 rating scale with 1 being the least painful to 4 being blinding. While you may disagree, he considers the pain from all of the aforementioned stingers as being no more than a 2. Of course, speaking from personal experience, multiple stings delivered by a hoard of ticked-off baldfaced hornets would cause me to rate the pain as a 10 … mostly associated with blind panic. You can learn more about the Schmidt Sting Pain Index and even listen to a fascinating interview with him that aired last year on “Science Friday” including descriptions of the stings of Tarantula Hawks (Pepsis spp. and Hemipepsis spp.) and Bullet Ants (Paraponera clavata). Just click on the hotlink labeled “From ‘Nettles’ to ‘Volcano,’ a Pain Scale for Insect Stings” under “More Information” below.